Jane Blaffer Owen CBE (1915–2010) was born in Houston, Texas, the daughter of Robert Lee Blaffer and Sarah Campbell Blaffer. She grew up traveling the world, and in 1933, graduated from the Ethel Walker School in Connecticut. She studied at Bryn Mawr, the Washington School of Diplomacy, and the Union Theological Seminary in New York. In 1941, she married Kenneth Dale Owen, a geologist and descendant of Robert Owen, the founder of the 1825 Owen/Maclure Community in New Harmony. Early in their marriage, Kenneth Owen introduced his bride to the town of his birth. Falling in love again, Jane Owen adopted this little town on the Wabash as her home, and thus was born a palette for her intelligence and unfettered generosity. 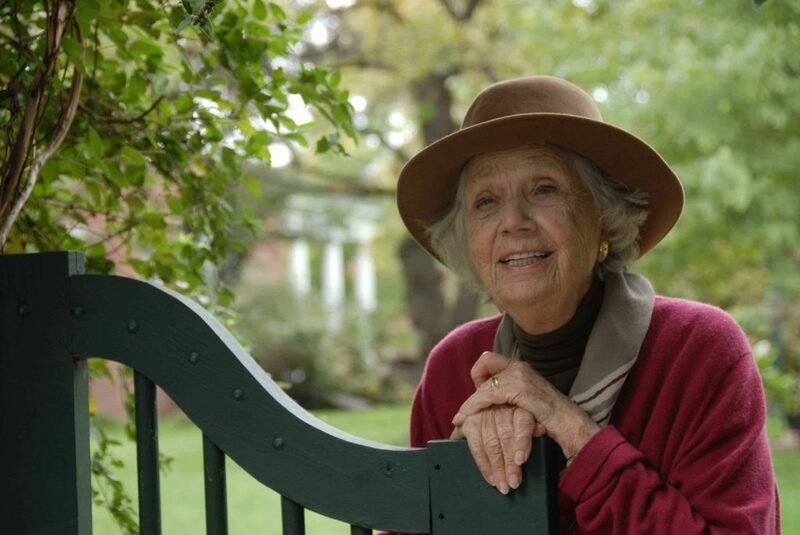 Channeling her philanthropic efforts, she established the Robert Lee Blaffer Foundation to preserve and promote the town’s historical and educational attributes. Among numerous other New Harmony initiatives, she commissioned Philip Johnson to design the Roofless Church; orchestrated the building of the visitors’ center, architect Richard Meier’s Atheneum; envisioned a spiritual retreat center and created the Macleod Barn Abbey; inspired and supported the restoration of the Rapp-Owen Granary; and encouraged spiritual awakening through the Cathedral Labyrinth, built for meditation and prayer. During her life, Jane Owen was the recipient of numerous awards and recognition. Most notably, she was named Commander of the British Empire, an honor bestowed by her majesty, Queen Elizabeth II. She received the prestigious Louise DuPont Crowninshield Award, presented by the National Trust for Historic Preservation, and the Sachem Award, presented by Indiana Governor Mitch Daniels to recognize a lifetime of excellence and virtue that brought credit and honor to the state.